Greetings, readers. After three or four months of continuously spending too much money, I’ve decided to make a budget on paper and try to stick to it. I need it on paper because that can be copied onto a computer document; I’ll be able to see it and work with it. For me it is always better when I can see something and adjust it as needed. My accountant has not been happy with me because I’ve been spending way too much money. So this morning, before our weekly meeting, I jotted down a preliminary budget that I am going to try in November. Expenditures include groceries, Zipcar rentals, medications, and trips to eat out. The first area I can work on is to cut down going to places like Panera and Denny’s. That will be difficult, for I love to get my morning coffee and blueberry muffin while I have my computer time, usually at Panera. If my spending situation does not improve, I will probably be forced to make coffee at home and find something breakfast-like to munch on. Instant oatmeal comes to mind as a good choice. I had it every morning during my school years. Downtown State College does not have a grocery store per se, but one of our drug stores close to me does have several food aisles. I’m going to compare prices with the other place I go to, which is right next door to me. I’ve never been good at saving money. I’m not a big impulse spender by any means, but every once in a great while if I see something I just have to have it. Now that I am on my new budget, that is the first thing that will definitely be cut out. Impulse spending is a no-no. Three of my biggest expenditures will be for Keekee, unfortunately. I have cat food to buy, cat litter, and of course her treats. Also there are her vet bills, like the upcoming check-up, but those are handled by the accountant. Keekee is my baby girl, and I’m not going to scimp on her. Briefly on another topic. Apartment cleaning is going well. Slow, but well. I’ve made definite strides in the living room and bedroom; I do think Rebecca is proud of me. I have set a lofty but obtainable goal for myself. I am planning to have my accountant and his wife over for coffee or tea near Christmas time. I have that long to get the place in white glove inspection order. My accountant doesn’t believe I can do it. That is all the incentive I need. Haha. Until Friday, take care, have a good few days, and as always, happy reading. Greetings, readers. Something this morning made me think about all the places I’ve been and all the places I still wish to see before I die. I thought to myself, wow, there is a top ten list to work on today. Probably only the top three will be in order. So, without further ado, here we go. #10. Walnut Grove, Minnesota. I would love to see the town made famous on Little House on the Prairie and visit the Laura Ingalls Wilder museum. #9. Take a trip to Holland to visit the relatives. #8. Catalina Island, California. I was there with my ex-wife Georgia once and it was beautiful. #7. Los Angeles, California. Georgia and I did the tourist attraction bus tours. That was such fun. I would love to do it again. #6. Wilmington, North Carolina. My friend David’s daughter is going to college there and she just loves it. It is about ten minutes away from the beach. If all goes well, I will see Wilmington at Emily’s graduation. #5. Gottlieben, Switzerland and the Drakensberg castle, which I remember as a hotel. Gottlieben is a little town, and I do mean little, on the Rhine river. Back in the day, you could take boat rides to various points along the river. #4. London, England. I would love to hop aboard a British Airways 747, fly to Heathrow airport, get on a double-decker tour bus and see the sights of London, including Big Ben and 65 Eaton Place. #3. I would dearly love to cruise on Royal Caribbean’s Voyager of the Seas. Georgia and I had a wonderful ten-day cruise and it was one of the highlights of my life. #2. While we are on the topic of cruising, two more ships come to mind. Cunard’s Queen Mary 2 (my parents and I traveled on Cunard’s Queen Elizabeth 2 when I was a child. I was too young to realize what a wonderful experience it was.) Also I would love to go aboard the Princess cruise line’s Pacific Princess, aka the Love Boat. #1. To continue to go to Bear Spring Camps in Maine for as many years as I can. It is my favorite place in the world. There you have it; an easy peasey top ten list for a Friday. Take care, have a great weekend, and happy reading. Greetings, readers. Yes, my world was thrown into a junior blind panic today as the notice of inspection was handed out. This does happen every year, but I always go into a tizzy. I’m a naturally messy homemaker, and my body won’t allow long cleaning sessions at one time. I am writing and editing today without Rebecca. She’s been under the weather the last two days. I’m sure she’ll be back next Wednesday, and it will be good to have her. My editing skills are not quite up to hers. After my work day today, room cleaning begins. I am tired of living like a slob; a real life Oscar Madison. All I have to do is put my mind to it, and once the place is clean, I can keep it that way. My dear friend, Uncle Cy Greco, once said, “A place for everything and everything in its place.” Right now I could say, “A typhoon hit my apartment and nothing is in its place.” Well, I’ll conclude this short blog entry today by asking you all to throw good thoughts Rebecca’s way to feel better and for my back to allow me to clean up my place without spasms. Until next week, take care, have a great weekend and happy reading. Update: I passed the inspection! Greetings, readers. I got some very sad news this past Sunday morning in a text from my ex-wife Georgia. 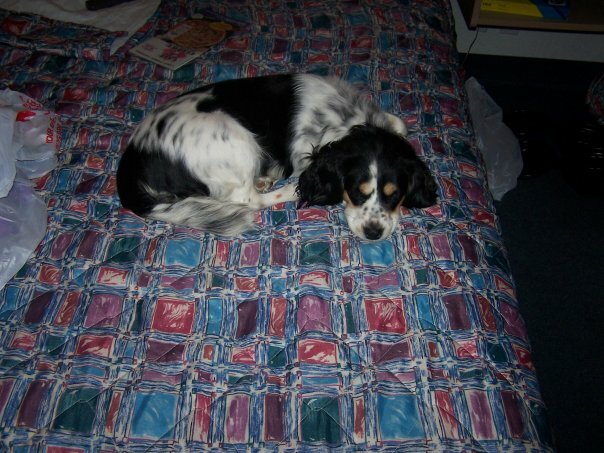 Our beloved pup Sassy, a cocker-spaniel and shih tzu mix that we commonly referred to as our four-legged daughter, passed away at age 10. The news hit me very hard. When I posted a mini R.I.P. on my Facebook page, I actually cried. Although I only knew her the first few years of her life, she took to me right away and in many ways became a daddy’s girl. When she needed to go for a walk, who did she come to and sit in front of? That’s right, me. I feel bad missing out on most of her life, but things happened and Georgia and my paths had to part. From time to time I would contact Georgia and I would always ask how Sassy was. She and Ted also recently lost another four-legged friend, Cooper. So my heart definitely goes out to them; too many losses too quickly. I know that when my kitty-cat Keekee goes to that big scratching post in the sky, I will be devastated. I know exactly how Georgia feels. I was the one who had to tell our vet to put my parents’ dogs to sleep due to cancer. Believe me readers, losing a pet is like losing a part of the family. In many ways they really are like little kids. Sassy, a cocker-spaniel and shih tzu mix, at age three or four. Until Friday, have a good couple of days, take care, and happy reading. Greetings, readers. Last night something happened to me which has only happened once before. I went to a place of business without my wallet. Here’s how it happened. On my mother’s credenza, sits a wooden duck. It’s sort of a bowl for storing things. I use it specifically to put my wallet and keys in; that way I know exactly where they are at all times. Last night my keys were on the dining room table. So after putting on my hoodie and loading my pockets with cell phone, keys and bus tokens, I thought, okay, I have everything, let’s go. After getting on the bus at the downtown stop, I plopped my bus token into the payment slot and took my seat. Off I went on the forty minute ride. When I got to Denny’s restaurant, my friend Jim had not arrived yet. I meet him there every week to catch up on the week’s happenings. I ordered a Coke with light amount of ice, looked at the menu, and then ordered. My food arrived while I was waiting for Jim. I emptied my hoodie pockets to be more comfortable and to my horror, my wallet was not with the things in my pocket. Jim arrived and we started talking. unfortunately, the conversation dealt a lot with my missing wallet. When I am upset about something, I tend to not be able to let it go. Did I lose it on the bus? Or did I forget to take it with me? From that moment until I got home, I did experience a junior nervous breakdown. It is a hopeless feeling knowing this money, debit card, and driver’s license could all be lost forever, and would then have to be replaced. What is worse, my security pass card to let me back into the apartment building was also in the wallet. That meant that at 10:00 at night I had to call a friend inside the building, have him walk down, and let me in. A wee bit on the embarrassing side. But I suppose these things happen. To my relief, when I got home, there was my wallet sitting safely in the duck. I actually remember saying out loud, “Oh goodie, I’ll be able to sleep tonight.” If the wallet had really been gone, I would have been too angry and frustrated to doze off. Danger was averted, as well as a lot of paperwork. What was so funny was, I went to a psychological testing that day to see what is wrong with my memory. It was the first of three testing dates. Rachel, the technician, is a sweet person and the testing is not too tedious. Hopefully they will be able to find out why I am beginning to forget things and not retain information. As I told my accountant this afternoon, I think it is a combination of age, slight brain damage from seizures, and my seizure medication. In four to six weeks, I’ll have my evaluation and hopefully there will be an answer to what is wrong with me. Please keep your fingers crossed for good news. Until Friday, take care, enjoy good weather if you have it and happy reading.